*Note: If you do not have garam masala, use 1/2 teaspoon each ground cardamom, coriander and cumin; 1/4 teaspoon each ground cinnamon and black pepper; and 1/8 teaspoon ground cloves. 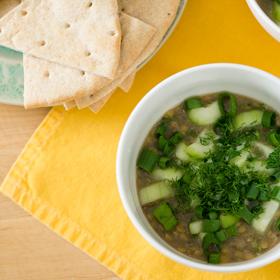 Place lentils in large bowl and fill with cold water. Using your fingers, stir lentils 3 to 4 times, then drain. Repeat 2 to 3 times, until water runs nearly clear when drained. Transfer lentils to large saucepan. Add onion, garlic, ginger, garam masala, cumin and oil. Stir to coat ingredients with oil. Set saucepan over medium-high heat and cook, stirring occasionally, until spices are fragrant, about 4 minutes. Add hot water, bring to boil, cover, and simmer until lentils are soft, 20 minutes; dal will thicken as it cools. Uncover and pour dal into wide, shallow bowl. Set aside until lukewarm, 20 minutes. Season to taste with salt. To serve, divide dal among 4 small soup bowls. Top each with 1/4 of cucumber, scallions and dill, plus 1 tablespoon yogurt. Cut pitas into 6 wedges. Set each bowl on dinner plate, surround with pita wedges and serve. Serving size: 1/4 of recipe. Amount per serving: 260 calories, 5g total fat (0g saturated fat), 40g carbohydrates, 15g protein, 8g dietary fiber, 135mg sodium.